At Red Hook Park there are many activities that can fill your day. The park is mostly used for the pee wee teams to play soccer, but on weekends there are special events. On weekends, the Red Hook Vendors come in their trucks and sell all types of Central American food. You can get Mexican, Guatemalan, and Salvadoran food. So, take a little time to look into Red Hook Vendors and try a new delicious food. In 2007, when the vendors were shut down temporarily for violating city health codes, Architecture for Humanity held a competition to redesign Red Hook Park for the Red Hook Vendors. 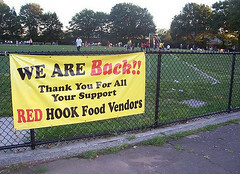 Red hook vendors coming back poster.